Listen to Dale Taylor chat away with TOWN MOUNTAIN’S own JESSE LANGLAIS (banjo) regarding all things Town Mountain and an exciting 2015! ASHEVILLE, NC — Town Mountain’s hard drivin’ bluegrass sound, tight harmonies, and stellar in-house songwriting have become the band’s trademark. They light up the stage with their honky tonk edge and barroom swagger, featuring a Jimmy Martin-style bounce and confidence that is countered at times by a laid-back John Hartford-esque groove. 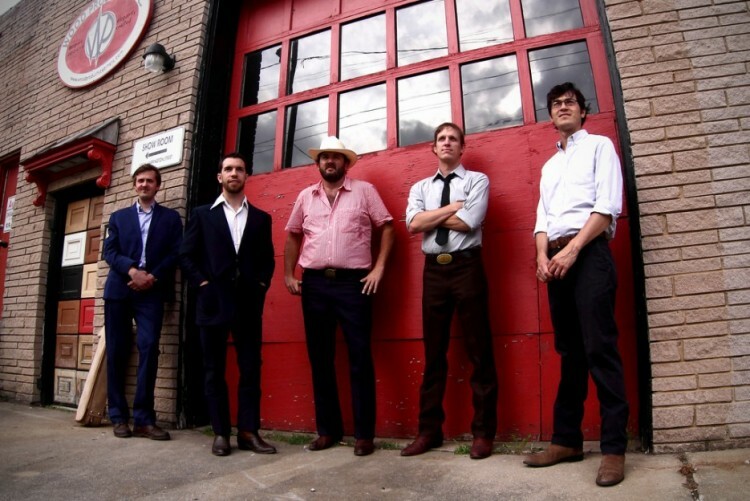 Town Mountain includes Robert Greer on vocals and guitar, Jesse Langlais on banjo and vocals, Bobby Britt on fiddle, Phil Barker on mandolin and vocals, and Nick DiSebastian on bass. The band will be heading to Breaux Bridge, Louisiana the first week of January 2015 to record their 5th studio release at The Cypress House with Grammy Award winner Dirk Powell, who will be acting as audio engineer and producer. Town Mountain is in it for the long haul… check out out where they’ll be travelin’ to next and keep and eye on TownMountain.net for further dates and updates from the road at facebook.com/TownMountain and twitter.com/TownMountain. I love town mountain. Please more town mountain.